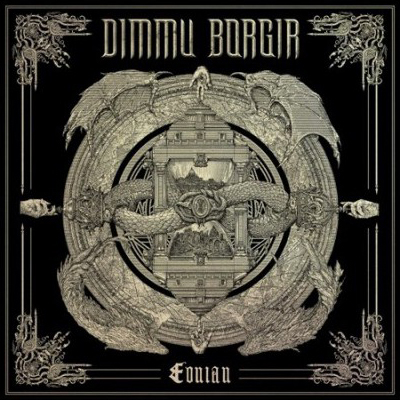 Hall of the Mountain King: Review: Dimmu Borgir, "Eonian"
This is Dimmu Borgir's first new music in seven years, and I’ll preface this review by saying that I’m not a black metal fan, and I’m only a marginal fan of the band. My favorite Dimmu tune is “Progenies of the Great Apocalypse,” so if you love the band’s earlier work and black metal in general, you'll probably completely disagree with what I have to say. This album is very heavy on the symphonics, and since I’ve copped to the fact that “Progenies” is my favorite song by Dimmu Borgir, it will come as no surprise that I really dig that aspect of it. There’s really not a lot of what I’d call “black metal” here beyond Shagrath’s vocals, and even they don’t always fit the harsh mold you expect. There are also some really nice memorable riffs scattered around the album that I don’t normally associate with the genre. It’s far more symphonic than black, and instrumental album closer “Rite of Passage” sounds almost progressive. The symphonics are not always a good thing. Some of the songs, like album opener “The Unveiling” drone on until you can’t wait for them to end. The backing vocals also occasionally sound a bit hokey. Black metal fans and old school Dimmu fans will likely hate Eonian. Fans of symphonic metal, on the other hand, will probably be surprised by how much they’re enjoying a “black metal” record. It’s certainly not every day listening for me, but I find it very interesting. Review: The Dead Daisies, "Burn It Down"